Author multimediaPosted on April 7, 2018 October 29, 2018 Categories Blog PageTags 35th anniversary, historyLeave a comment on Happy 35th Birthday, Pinkies!! Hello, my name's Claire and I'm a lesbian. Lesbian. It’s a word. It’s a word that I use to describe myself. I’ve used this word to describe myself for a long time, but truly it is only the last few years that I wear this word like a layer of skin; an epidermis; a fully functioning part of myself that exists in peace rather than a badge that gets brought out on occasion. It’s part of my identity that I share and I don’t care who knows. 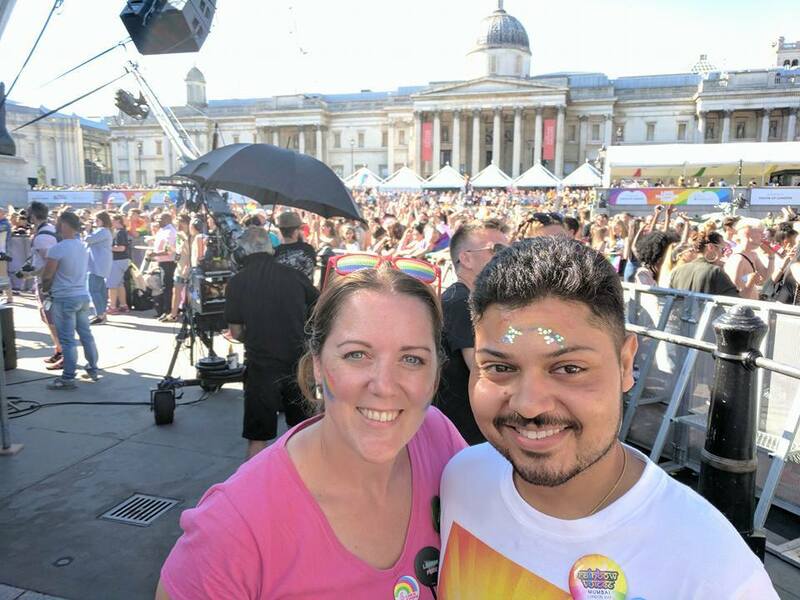 I realise I am in a fortunate position – this country has come a long way to protect the rights of LGBTQ people and the way the community is perceived. 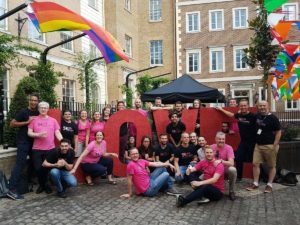 Growing up in Thatcher’s Britain, there was Section 28, homophobic mainstream media, no positive gay role models on TV that I could identify with, the word ‘lesbian’ thrown around my classroom like a shameful slur…. In short, growing up as a gay kid in the 80’s was a lonely experience. To quote the fine words of Skunk Anansie, ‘It takes blood and guts to be this cool, but I’m still such a cliché’. 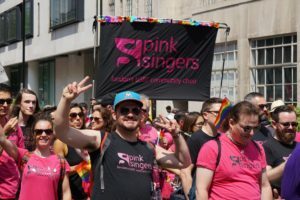 I think it is human nature to reach out to others like yourself and being part of the LGBTQ community, I have done just that: joining the Pink Singers (coming up to 15 years now.. eeek!) 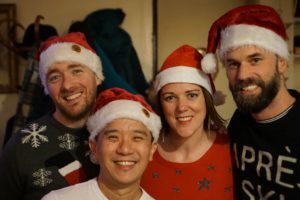 not only normalised my gayness but I have also been blessed with amazing friendship, companionship, laughter, LGBTQ campaigning buddies (home and abroad), and compassion – all wrapped up in a big glitterball of song and sparkle. By being part of the LGBTQ community I have had the opportunity to perform and campaign all over the world: Iceland, France, Ireland, Denmark and more recently, India. I feel it is my duty as part of this community to campaign for the rights of our friends abroad who are not as fortunate as we are in the UK; to campaign for equality and to address hate in all forms. 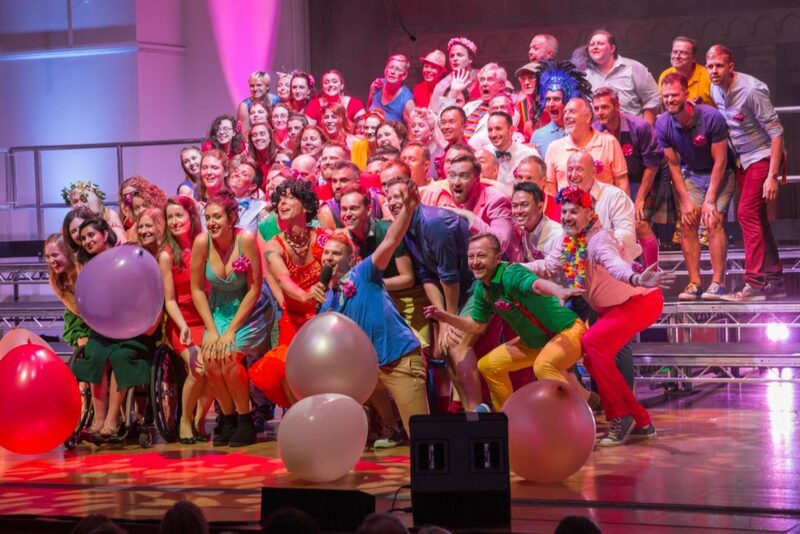 I am so excited to be welcoming our friends from Rainbow Voices Mumbai in July this year to march with us in London Pride and perform with us in London – part of a year long, life changing cultural exchange. 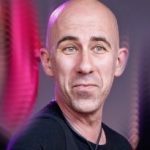 The brief I was given for this blog was ‘how has being LGBTQ changed your life’. Well, to be honest, it is my life, it is who I am. 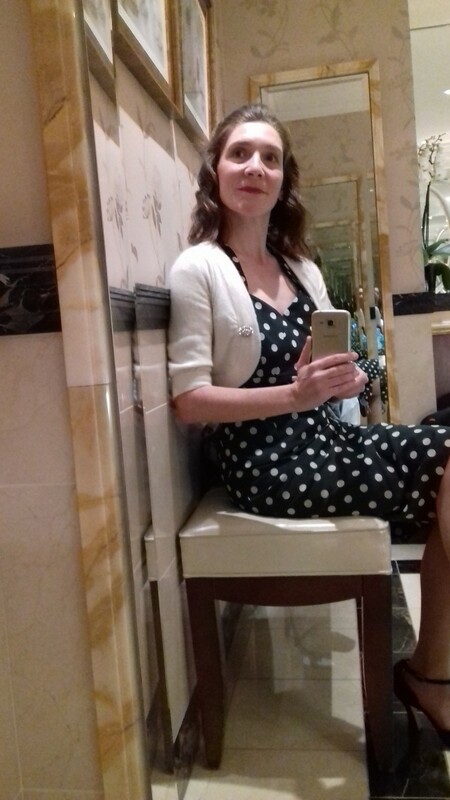 But only one part of me: I am also a daughter, sister, friend, lover, singer, performer, colleague, activist, transport nerd, indie tunes enthusiast, fan of drinking tea and dancing (although not necessarily at the same time) and so much more. Hello, my name is Claire and I am a lesbian. 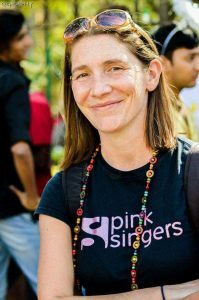 There’s still time to book tickets to see us and our special guests, Out Aloud from Sheffield and Rainbow Voices Mumbai. Please click here to book! Author multimediaPosted on June 30, 2017 October 29, 2018 Categories Blog PageTags community, equality, history, identity, rights1 Comment on Hello, my name's Claire and I'm a lesbian. 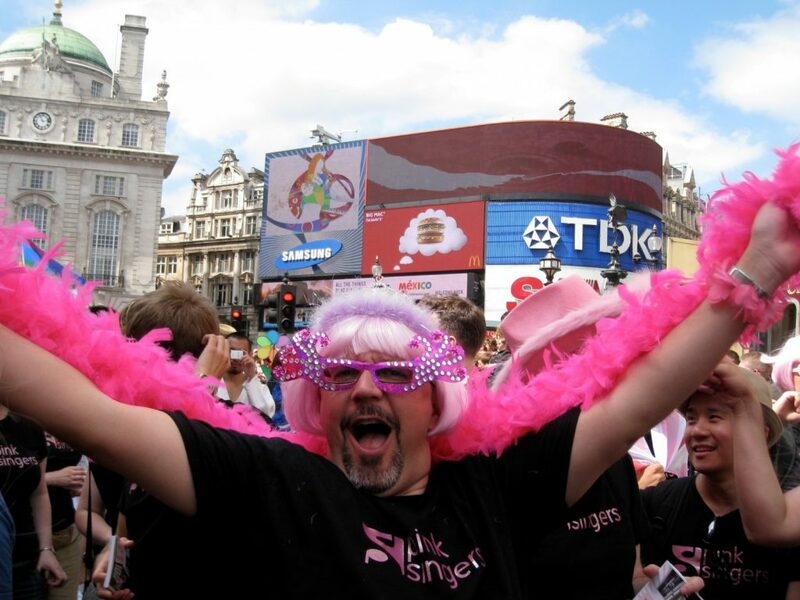 Last month, Pinkie veteran Michael Derrick celebrated his third decade in the choir. 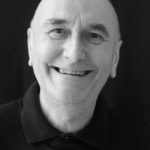 Whilst an active singing (and dancing) member, he has also been the Musical Director (1988 – 1992), accompanist and one of our favourite arrangers. Here, he describes how the choir has (or hasn’t) changed over the last thirty years and what being in the choir means to him. My first rehearsal was on the last Sunday of October, 1986. It was on a Sunday afternoon because that was the only time the whole choir was free: before the liberalisation of opening hours, pubs closed after lunchtime drinking and didn’t open again until the evening. What else was there to do? Join a choir, obviously. The rehearsal was in the basement of the London Lesbian and Gay Centre: a dingy space with a low ceiling, out-of-tune piano, no natural light, and the smell of cigarettes and beer from the previous night’s disco. We ‘suffered for our art’. There were about 15 regular singers; all men. The repertoire consisted of show tunes, protest songs, and earnest post-war German cabaret lieder. 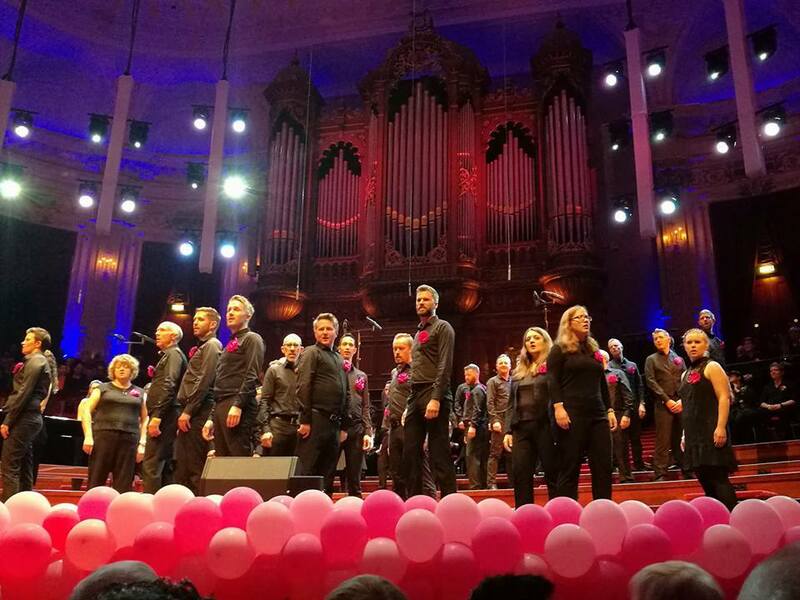 The other choirs in Europe were into pop songs and classical music but they tolerated our seriousness because we had Margaret Thatcher, Section 28 and an age of consent of 21. 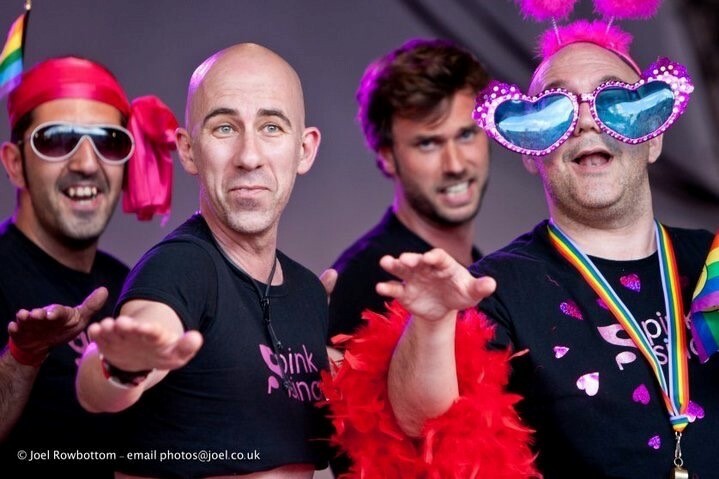 They knew that we were “Pink” because that was the colour of the triangle that homosexuals were forced to wear by the Nazis. 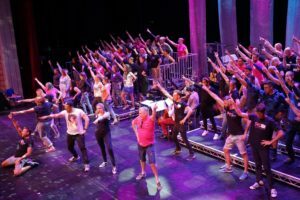 “Every rehearsal was part of a build-up to a concert: a performance and then a new set of repertoire and so on. And at every rehearsal there was the aim of putting on the next concert. So there was a very well defined set of objectives for each rehearsal. That was the choir that I joined and it’s more or less the structure that has survived to this day”. 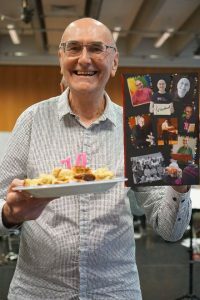 As well as celebrating his 30th anniversary with the choir, Michael also turned 70 this year! 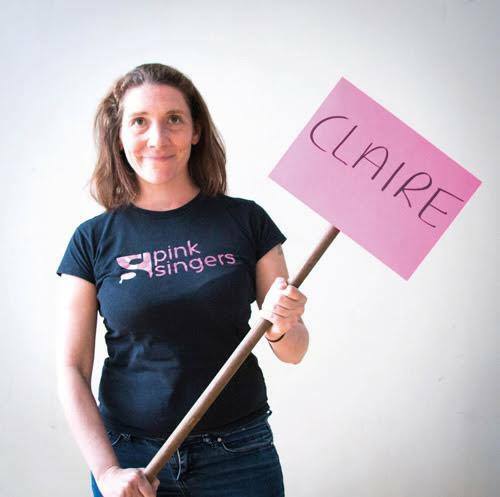 Thirty years later we are still Pink, still protesting, and still rehearsing on Sunday afternoons; but a lot has changed. Most notably we are a mixed choir. “Mixed” usually means Men and Women. I am proud to say that we are much more mixed than that! 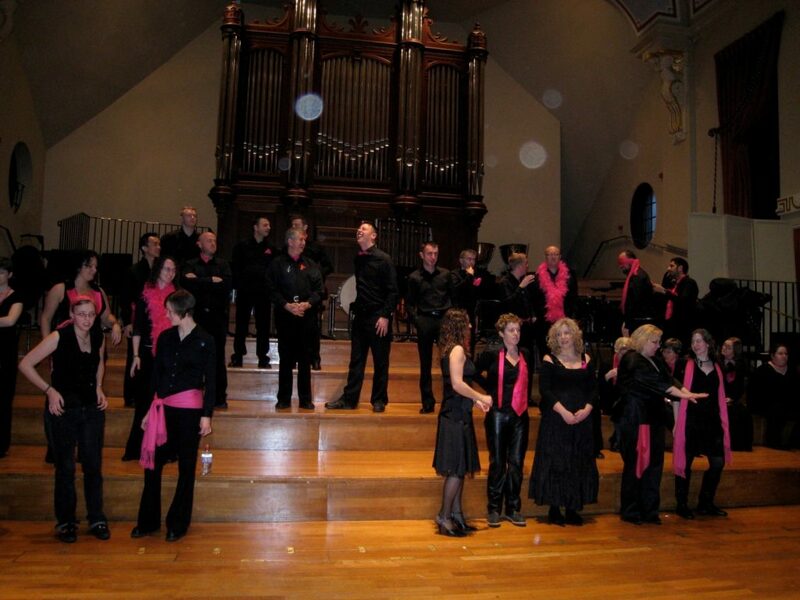 A strength of the choir is the large number of members who write arrangements. In the early days, arrangements had to be written because that was the only way we could perform the songs we wanted to sing. When women started to join the choir, songs were regularly re-arranged to give the increasing numbers of higher voices something to sing. 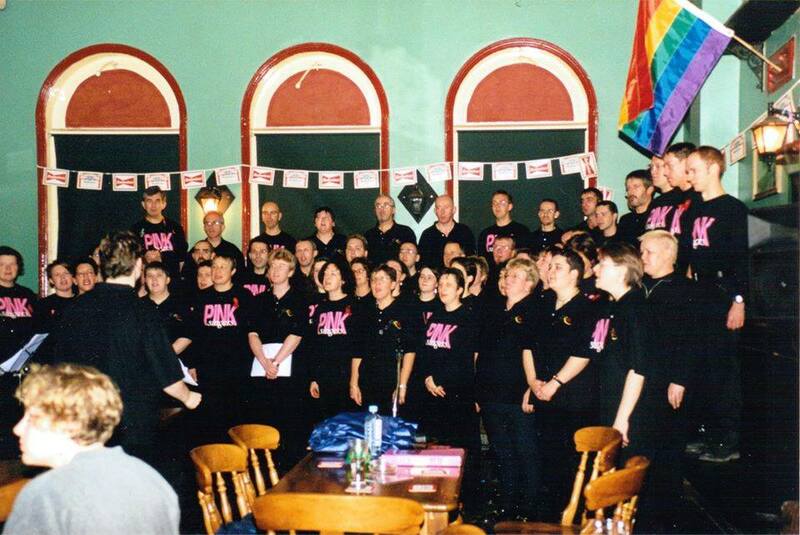 We continue this tradition and it makes us very special – not many choirs do it. There have been many other changes over the years but one thing has stayed exactly the same: after my first rehearsal we all went to the pub. The social side of the choir is very strong. It has often been described as a family. Friendships have been made and relationships forged. It has been a complete delight to have been a Pinkie for thirty years.